Overview Full, Queen: 90″ wide x 88″ long Add a touch of classic charm to their sleeping space with our ultrasoft duvet cover in a vibrant tartan plaid. This organic cotton layer will keep your little one warm throughout the night. Even better, its Oeko-Tex® Certified to be both safe and chemical-free. DETAILS THAT MATTER Duvet cover is finished with interior corner ties and a hidden button closure to keep the duvet in place. Sham has flap closure. Duvet cover reverses to same pattern. Hypoallergenic to protect against allergens and create a healthy sleep environment. Oeko-Tex® Certified: tested in a third-party lab and verified to be free from over 300 harmful substances. Certified GOTS (Global Organic Textile Standards): This product meets the gold standard of textile production it exceeds organic fiber requirements, contains no restricted chemicals and meets strict social responsibility standards. Made in a Fair Trade Certified facility. Learn more HOW IT IS CONSTRUCTED Made of 100% organic cotton in flannel weave. Organic cotton is grown without the use of toxic and persistent pesticides and synthetic fertilizers. Flannel is a loosely knit fabric and is known for its softness, and warmth. Bedding is yarn-dyed Fibers are treated individually with environmentally safe dyes before weaving to offer vibrant, lasting colors. 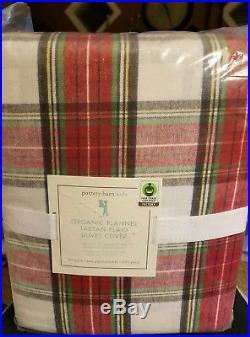 The item “Pottery Barn Kids Organic Tartan Plaid Flannel Cotton Full Queen Duvet Cover New” is in sale since Monday, May 14, 2018. This item is in the category “Home & Garden\Bedding\Duvet Covers & Sets”. The seller is “9022michele” and is located in New Cumberland, Pennsylvania. This item can be shipped to United States, Canada, United Kingdom, Denmark, Romania, Slovakia, Bulgaria, Czech republic, Finland, Hungary, Latvia, Lithuania, Malta, Estonia, Australia, Greece, Portugal, Cyprus, Slovenia, Japan, China, Sweden, South Korea, Indonesia, Taiwan, South africa, Thailand, Belgium, France, Hong Kong, Ireland, Netherlands, Poland, Spain, Italy, Germany, Austria, Israel, Mexico, New Zealand, Philippines, Singapore, Switzerland, Norway, Saudi arabia, Ukraine, United arab emirates, Qatar, Kuwait, Bahrain, Croatia, Malaysia, Brazil, Chile, Colombia, Costa rica, Dominican republic, Panama, Trinidad and tobago, Guatemala, El salvador, Honduras, Jamaica.